Israeli forces continued with systematic crimes in the occupied Palestinian territory (oPt), for the week of 14- 20 December, 2017. Four civilians were killed, including a lower-limb amputee, in the West Bank and Gaza Strip. 256 Palestinian civilians, including 29 children, 5 journalists and 4 paramedics, were wounded. Israeli warplanes launched 15 missiles in 4 airstrikes at different targets in the Gaza Strip, with no casualties were reported, while Israeli forces conducted 67 incursions into Palestinian communities in the West Bank and 3 limited incursions into the Gaza Strip. During the reporting period, Israeli forces killed 4 Palestinian civilians, including a lower-limb amputee, in the West Bank and Gaza Strip. They also wounded 256 Palestinian civilians; including 29 children and 5 journalists; one is Indonesian, in the West Bank and Gaza Strip. Moreover, in the Gaza Strip, Israeli warplanes carried out several airstrikes targeting military training sites and watchtowers belonging to the Palestinian armed groups, resulting in damage to the surrounding civilians’ property. The Israeli forces continued to chase fishermen in the Gaza Sea and target border areas in the Gaza Strip. In the Gaza Strip, on 15 December 2017, Israeli forces killed 2 Palestinian civilians, including a wheelchair-bound young man. According to PCHR’s investigations on 15 December 2017, dozens of young men and youngsters gathered tens of meters away from the border fence with Israel near former Nahal Oz Crossing, east of al-Shuja’iyah neighbourhood, east of Gaza City. They set fire to tires, threw stones at the Israeli forces stationed along the border fence in protest against the U.S. President’s decision to recognize Jerusalem as the Capital of Israel. During the 6-hour clashes, the Israeli soldiers sporadically fired tear gas canisters and live and rubber-coated metal bullets at the protestors. As a result, 2 civilians, from al-Shuja’iyah neighborhood in Gaza, were killed with live bullets; one of them is disabled with no legs. The killed civilians were identified as Yasser Naji Sukar (23) hit with a bullet to the head and Ibrahim Nayeh Ibrahim Abu Thurayah (29) hit with a bullet to the forehead, noting that he lost his legs in an Israeli airstrike back in 2008. The border areas with Israel witnessed protests against the U.S. President Donald Trump’s decision to recognize Jerusalem s the capital of Israel and move the U.S. Embassy to it. During the protests, the Israeli forces used force against the protestors. Due to opening fire to disperse the protests, 180 civilians, including 22 children and 2 journalists; one of them an Indonesian, were wounded. One Hundred and five of them were hit with live bullets, 5 were hit with rubber-coated metal bullets, and 70 were directly hit with tear gas canisters. As part of the Israeli airstrikes, Israeli warplanes launched 15 missiles in 4 airstrikes against 4 military training sites belonging to the Palestinian armed groups. On 14 December 2017, Israeli warplanes carried out 3 airstrikes against 3 sites; Bader Military Site, northwest of Gaza City; Quraish Site, southwest of the city; and Bahriyah site, southwest of Deir al-Balah in the central Gaza Strip. On 15 December 2017, Israeli warplanes targeted a site affiliated with al-Qassam Brigades, the military wing of Hamas, northwest of Beit Lahia in the northern Gaza Strip. In the Gaza Strip, as part of targeting fishermen in the sea, PCHR monitored the Israeli naval forces’ escalation against fishermen in the Gaza Sea as on 12 December 2017 the Israeli forces decreased the allowed fishing area from 9 to 6 nautical miles. This proves that the Israeli forces continue their policy of targeting fishermen in their livelihoods. During the reporting period, Israeli gunboats chased fishing boats and opened fire at them 9 times; 6 of them in the western Soudaniyah area, west of Jabalia in the northern Gaza Strip, and one incident in each of Beit Lahia; Deir al-Balah; and Khan Younis. As part of targeting the border areas, On 18 December 2017, Israeli forces stationed inside the watchtowers at Beit Hanoun Erez Crossing and its vicinity, north of Beit Hanoun in the northern Gaza Strip, opened fire at the border area. The fire recurred from those watchtowers at the northern side of the Agriculture School, north of Beit Hanoun, on 19 December 2017. On 20 December 2017, the Israeli forces fired an artillery shell at a vacant land in the vicinity of the landfill, east of Gaza Valley village (Johr al-Deek). On 20 December 2017, Israeli forces heavily opened fire at Eastern ‘Abasan al-Kabirah, east of Khan Younis in the southern Gaza Strip. Neither causalities nor damage to the civilians’ property were reported in all incidents. In the West Bank, Israeli forces killed 2 Palestinian protesters. According to PCHR’s investigations on 15 December 2017, dozens of young men and youngsters gathered at the northern entrance to al-Bireh. They set fire to tires and threw stones and empty bottles at the Israeli soldiers stationed at DCO checkpoint. The Israeli soldiers fired live and rubber-coated metal bullets and tear gas canisters at the protesters. At approximately 14:00, Amir ‘Aqel al-‘Adam (19) from Beit Oula village, west of Hebron, holding a knife approached the soldiers and stabbed one of them He then took 4 steps backwards, and the Israeli soldiers fired 3 consecutive bullets at him, wounding him with 2 bullets in his foot. Al-Adam then fell on the ground, and another bullet was fired to the right side of his chest, from a point-blank range, while he was lying on the ground. He was liquidated as documented in a video taken by a journalist’s camera. The video showed al-‘Adam lying on the ground and receiving bullet after another and suffering a lot with the soldiers’ giving no attention to him. On the same day, residents of ‘Anata village, east of occupied Jerusalem, organized a protest at the village intersection. They threw stones at the settlers’ cars passing through the intersection. As a result, one of the cars’ windows was broken. Israeli forces immediately arrived and heavily opened fire at the stone-throwers. As a result, Basel Mustafa Mohammed Ibrahim (29) was shot dead with several bullets to his chest. All the cities witnessed protests against the U.S. President’s decision. During those protests, Israeli forces used force against the protesters. The shooting to disperse the protests resulted in the killing of 2 protestors and the injury of 76 civilians, including 7 children and 5 journalists. Eleven of them were hit with bullets, 60 with rubber-coated metal bullets and 5 were directly with tear gas canisters. Moreover, on 19 December 2017, Two Palestinian civilians were wounded with rubber0coated metal bullets when Israeli forces moved into Beit Forik village, east of Nablus, to carry out an arrest campaign in the village. A number of civilians gathered and protested, so the Israeli forces fired rubber-coated metal bullets at them. On 20 December 2017, 6 Palestinian civilians, including 2 children, were wounded when Israeli forces moved into Nablus. A number of Palestinians gathered and protested against the soldiers, who in response fired live and rubber-coated metal bullets at them. As a result, a civilian was hit with a Two-Two bullet in the chest and seriously wounded while the other five were hit with rubber-coated metal bullets. During the reporting period, Israeli forces conducted at least 67 military incursions into Palestinian communities in the West Bank while they conducted 11 incursions into Jerusalem and its suburbs. During those incursions, Israeli forces arrested at least 46 Palestinian civilians, including 8 children and 2 women, in the West Bank. Twenty-five of them, including 6 children, were arrested in Jerusalem and its suburbs. They also arrested 11 civilians, including 3 children, in the West Bank during protests against the U.S. President’s decision. Meanwhile, 23 civilians, including 2 women, were arrested in Jerusalem on the same grounds. Thus, the number of arrestees in the West Bank and occupied Jerusalem rose to 105 civilians, including 17 children and 4 women. During the reporting period, the Israeli forces raided 4 printing houses; 3 of them in Nablus, to search for the posters they print. The printing houses were identified as al-Manahel in front of Northern Baltah entrance; Lamsah Faniyah on al-Quds Street; al-Hejawi in the eastern area of the city and Infinity Company for Advertising in Hebron. As part of the house demolitions, on 19 December 2017, the Israeli Municipality forced Haitham Abu Rumouz to self-demolish his house in Ras al-‘Aboud neighbourhood in Silwan village, under the pretext of non-licensing. Haitham said that he started to self-demolish his house implementing the Municipality’s decision and avoiding paying the demolition costs and a financial fine. The 2-storey house is built of tin plates on area of 15o square meters. The brick-roofed house was built ten years ago. As part of restricting the NGOs’ work, on 16 December 2017, Israeli forces raided and searched Abu Jihad Museum for Prisoner Movement Affairs in Abu Dis village, east of occupied Jerusalem. They searched documents and photographic materials which document the Israeli forces’ practices. The Museum contains 130,000 documents in the archives department, which was destroyed by the Israeli forces. He also confirmed that the museum displays humanitarian stories of the Palestinian prisoners and documents the history of prisoner movement established in 1997 to maintain the cultural and literary heritage of the prisoner movement. It also exhibits the prisoners’ handicrafts, messages, news, and literary and cultural productions. At approximately 01:00 on Thursdays, 14 December 2017, dozens of Palestinian civilians organized a protest at the northern entrance to al-Birah. They threw stones and empty bottles at Israeli soldiers stationed at (DCO) Checkpoint. The soldiers fired live and metal bullets, sound bombs and tear gas canisters at the protestors. As a result, 2 civilians sustained metal bullet wounds. Around the same time, dozens of Palestinian youngsters organized a protest at the eastern entrance to al-Jalazoun refugee camp, north of Ramallah. The protestors threw stones and empty bottles at the security fence of “Beit Eil” The soldiers fired live and metal bullets, sound bombs and tear gas canisters at the protestors. As a result, 2 civilians, including a child, sustained metal bullet wounds. Around the same time, Palestinian civilians organized a protest in the vicinity of “Jishuri”Factories, west of Tulkarm. The Israeli forces fired metal bullets, sound bombs and tear gas canisters at the protestors. As a result, 3 civilians were wounded. One of them sustained a metal bullet to the head and the 2 others sustained metal bullet wounds. At approximately 13:00 on Friday, 15 December 2017, dozens of young men and youngsters gathered at the northern entrance to al-Bireh. They set fire to tires and threw stones and empty bottles at the Israeli soldiers stationed at DCO checkpoint. The Israeli soldiers fired live and rubber-coated metal bullets and tear gas canisters at the protesters. At approximately 14:00, Amir ‘Aqel al-‘Adam (19) from Beit Oula village, west of Hebron, holding a knife approached the soldiers and stabbed one of them. He then took 4 steps backwards, and the Israeli soldiers fired 3 consecutive bullets at him, wounding him with 2 bullets in his foot. Al-Adam then fell on the ground, and another bullet was fired to the right side of his chest while he was lying on the ground. He was liquidated as documented in a video taken by a journalist’s camera. The video showed al-‘Adam lying on the ground and receiving bullet after another and suffering a lot with the soldiers’ giving no attention to him. A PRCS crew then approached al-‘Adam to rescue him and evacuate him via an ambulance. However, the soldiers prevented the crew and confiscated the ambulance keys. Therefore, the PRCS crew with the help of Palestinian young men pulled al-‘Adam and ran away a distance of around 50 meters before putting him in a private car and heading to a hospital in Ramallah. In the afternoon, his death was declared after undergoing many urgent surgeries. Eyewitnesses said to PCHR’s fieldworker that al-‘Adam was directly shot at point-blank range. The eyewitnesses added that he was wearing fake explosive belt around his abdomen. As a resulted of clashes, 16 civilians sustained metal bullet wounds. Around the same time, dozens of Palestinian civilians gathered at the entrance to al-Nabi Saleh village, northwest of Ramallah. Israeli soldiers fired live and metal bullets, and tear gas canisters at the protestors. As a result, Mohammed Fadel al-Tamimi (15) sustained a metal bullet wound to the head. He was transferred via a PRCS ambulance to the Istishari Arab Hospital in al-Raihan suburb. Medical sources classified his injury as serious. Around the same time, Palestinian civilians organized a protest at the eastern entrance to Kafer Qadoum village, northeast of Qalqiliya. Israeli forces fired metal bullets, sound bombs and tear gas canisters at them. As a result, 3 civilians sustained metal bullet wounds. Following the Friday prayer, dozens of Palestinian young men gathered in the vicinity of Bilal Ben Rabah Mosque known as “Rachel Tomb” at the northern entrance to Bethlehem. Israeli soldiers dispersed the protestors firing live and metal bullets, sound bombs and tear gas canisters. As a result, 3 civilians sustained metal bullet wounds. Around the same time, dozens of Palestinian civilians gathered in the vicinity of Howarah Checkpoint and made their way to the southern entrance to Nablus. They set fire to tires, put barricades on the street, which leads to the abovementioned checkpoint and threw stones and empty bottles at the Israeli soldiers. The soldiers fired live and metal bullets and tear gas canisters at them. As a result, 10 civilians, including 2 children, sustained metal bullet wounds. The Israeli forces also arrested Bayan Ahmed Sa’ad (20). Around the same time, dozens of Palestinian civilians protested at the western entrance to Beta village, southeast of Nablus. Israeli soldiers fired live and metal bullets and tear gas canisters at the protestors. As a result, a 23-year-old civilian sustained a metal bullet wound to the head. Around the same time, dozens of Palestinian civilians gathered in the vicinity of al-Jalmah Checkpoint, north of Jenin. They threw stones and empty bottles at Israeli soldiers stationed in the checkpoint. The soldiers fired live and metal bullets and tear gas canisters at them and chased them. The soldiers also arrested Mohammed Nasser Sbaih (21). Following the Friday prayer, dozens of Palestinian civilians organized a protest at ‘Atouf Coast in the northern Valleys, east of Tamoun village, south of Tubas. They threw stones and empty bottles at the Israeli soldiers stationed in the area. The soldiers fired live and metal bullets and tear gas canisters at the protestors and chased them. The Israeli forces arrested ‘Omeir ‘Ammra Hamed Sawaftah (18), Mohammed Ayman Husani Sharidah (20), Hutheifah Jehad Suleiman Daraghmeh (18), and Osama Labib Hamed Sawaftah (21). Around the same time, in the vicinity of “Jishuri” Factories, west of Tulkarm. The Israeli forces fired metal bullets, sound bombs and tear gas canisters at the protestors. As a result, Khairi Sa’ed Hanoun (62), Member of the Factional Coordination Committee in Tulkarm, from ‘Anabtah village, was hit with a tear gas canister, and an 18-year-old civilian sustained a metal bullet wound to the left hand. At approximately 15:00, a number of Palestinian young men gathered in al-‘Aroud area and made their way to Sa’ir village, east of Hebron. They threw stones at an Israeli force that arrived at the area. The soldiers chased the young men amidst firing sound bombs and tear gas canisters at them. The soldiers also arrested Mohanned ‘Ali Jaradat (19). At approximately 14:20, dozens of Palestinian civilians gathered in front of Qafin Gate established in the annexation wall, northeast of Tulkarm. They threw stones at Israeli soldiers, who were guarding the wall. The soldiers fired metal bullets, sound bombs and tear gas canisters at the protestors and chased them. They also arrested ‘Odai Husam ‘Awni Khasib (17) and ‘Ali Mohammed ‘Ali Dawoud (22). At approximately 16:30, dozens of Palestinian civilians protested in al-Naqqar neighborhood near the northern entrance to Qalqiliyah. Israeli soldiers fired live and metal bullets, sound bombs and tear gas canisters at them. As a result, a 23-year-old civilian sustained a metal bullet wound to the back. At approximately 16:30 on Saturday, 16 December 2017, dozens of Palestinian youngsters organized a protest near the annexation wall’s gate in Zeta village, northwest of Tulkarm. Israeli soldiers fired sound bombs and tear gas canisters at the youngsters and chased them. The soldiers also arrested Mohammed Zeyad Tayi’e (15) and released him few hours later. At approximately 13:00 on Wednesday, 20 December 2017, dozens of Palestinian young men gathered at the northern entrance to al-Birah. They set fire to tires and threw stones and empty bottles at Israeli soldiers stationed at DCO Checkpoint. The soldiers fired live and metal bullets and tear gas canisters at them. As a result, 3 civilians sustained live bullet wounds to the lower limbs of their bodies. Around the same time, dozens of Palestinian civilians protested at the entrance to Beit Ummer village, north of Hebron. They set fire to tires on the main street of ‘Asidah area. Israeli forces moved towards the village and closed the road. Moreover, a number of the soldiers topped the shops’ roofs and fired live bullets at the protestors. As a result, a 16-year-old civilian sustained a live bullet wound to the leg. Northern Gaza Strip: the confrontations were mainly in the vicinity of al-Shuhadaa’ Cemetery, east of Jabalia; in the vicinity of Beit Hanoun Crossing. As a result, 2 children sustained live bullet wounds. Northern Gaza Strip: the confrontations were mainly in the vicinity of al-Shuhadaa’ Cemetery, east of Jabalia and in the vicinity of Beit Hanoun Crossing. As a result, 59 Palestinians, including 7 children, were wounded. Thirty eight of them sustained live bullet wounds, one civilian sustained a metal bullet wound, and 18 were hit with tear gas canisters. In addition, 2 paramedics suffered tear gas inhalation after a tear gas canister hit the PRCS ambulance and broke the window of the right door. The paramedics were identified as Ahmed Abdul Bari al-‘Abed Abu Foul (34) and Ramez Abdul Hai Mousa al-‘Ajrami (38) from Jabalia. Moreover, an Indonesian journalist; Mohammed Husein Aji Muslem Shaheri (29), who works at the Indonesian News Agency, was hit with a tear gas canister to the head, and a security officer sustained a live bullet wound to the left arm while on duty at the crossing. Gaza City: the clashes and Israeli shooting were mainly near former Nahal Oz Crossing, east of al-Shuja’iyah neighborhood. As a result, 41 Palestinians, including 3 children, were wounded. Twenty-three of them were hit with live bullets; and 18 were hit with tear gas canisters. At approximately 13:30 on Friday, 15 December 2017, dozens of young men and youngsters gathered tens of meters away from the border fence with Israel near former Nahal Oz Crossing, east of al-Shuja’iyah neighborhood, east of Gaza City. They set fire to tires, threw stones at the Israeli forces stationed along the border fence in protest against the U.S. President’s decision to recognize Jerusalem as the Capital of Israel. During the 6-hour clashes, the Israeli soldiers sporadically fired tear gas canisters and live and rubber-coated metal bullets at the protestors. As a result, 2 civilians, from al-Shuja’iyah neighborhood in Gaza, were killed with live bullets; one of them is disabled with no legs. The killed civilians were identified as Yasser Naji Sukar (23) hit with a bullet to the head and Ibrahim Nayeh Ibrahim Abu Thurayah (29) hit with a bullet to the forehead, noting that he lost his legs in an Israeli airstrike in 2008. According to PCHR’s investigations, wheelchair-bound Abu Thurayah was directly shot to the head when he was 30 meters away from the border fence, where Israeli forces can clearly see him, and did not pose any threat to the soldiers. Moreover, shooting him in the forehead prove that he was deliberately sniped by the Israeli soldiers, without posing any threat to the soldiers’ lives, during a protest that was only about chanting slogans, throwing stones and setting fire to tires. This also emphasizes that the Israeli forces used lethal and disproportionate force against unarmed civilians. 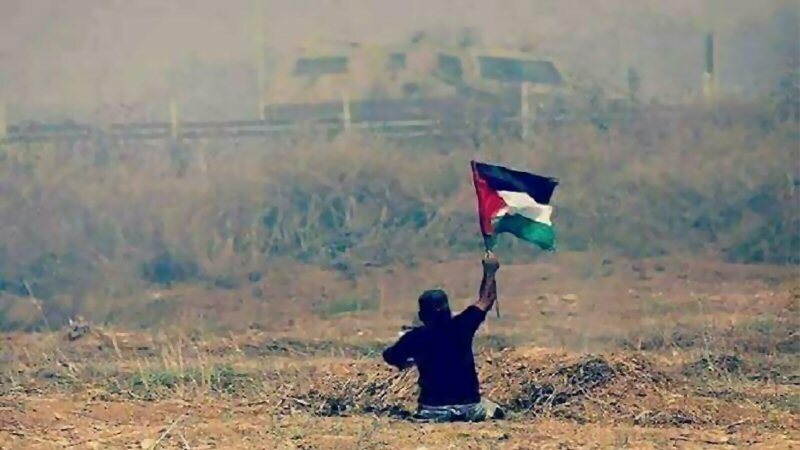 Central Gaza Strip: the clashes and Israeli shooting occurred in the eastern side of al-Bureij refugee camp. As a result, 11 Palestinians, including 2 children, were wounded. Seven of them sustained live bullet wounds, and 5 civilians were directly hit with tear gas canisters. Khan Yunis: the clashes and Israeli shooting were concentrated in ‘Abasan al-Kabirirah; Khuza’ah; al-Fukhari and al-Qararah. As a result, 23 civilians, including 5 civilians and a journalist, were wounded. Eighteen of them sustained live bullet wounds, 4 civilians sustained metal bullet wounds and one civilian was hit with a tear gas canister to the button. Moreover, journalist ‘Amer Samih Hasan al-Khatib (29) sustained a live bullet wound to the right foot. Rafah: the clashes and Israeli shooting mainly occurred in the eastern side of al-Shawkah village, east of Rafah. As a result, 37 civilians, including 2 children, were wounded. Ten of them sustained live bullet wounds, and 27 others were directly hit with tear gas canisters. Gaza City: the clashes and Israeli shooting were mainly near former Nahal Oz Crossing, east of al-Shuja’iyah neighborhood. As a result, 3 civilians were wounded. Two of them sustained live bullet wounds and one civilian sustained live bullet shrapnel. Central Gaza Strip: the clashes occurred in the eastern side of al-Bureij refugee camp. As a result, one civilian sustained a live bullet wound to the left leg. Gaza City: the clashes and Israeli shooting were mainly near former Nahal Oz Crossing, east of al-Shuja’iyah neighborhood. As a result, 4 civilians were wounded. Three of them sustained live bullet wounds, and one civilian was hit with a tear gas canister to the face. Central Gaza Strip: the clashes occurred in the eastern side of al-Bureij refugee camp. As a result, on civilian sustained a live bullet wound to the thigh. On Thursday, 14 December 2017, Israeli forces used force to break up the daily sit-in in Bab al-‘Amoud (Damascus Gate) area in occupied Jerusalem. Around 26 civilians sustained bruises while 7 others were arrested and subjected to severe beating. According to PCHR’s investigation and eyewitnesses’ statement, the Israeli forces attacked the protestors and severely beat them up, in addition to dispersing them by force and keeping them away from the area. The Israeli forces then completely closed all entrances and prevented Palestinian civilians from entering the area. The eyewitnesses said that Mounted Police officers also attacked the civilians, who were on Bab al-‘Amoud (Damascus Gate) and al-Sultan Saleem Streets, in order to keep them away from the area. The Palestinian Red Crescent Society (PRCS) stated that around 26 Palestinian civilians sustained bruises while suppressing the sit-in. Lawyer Mohamed Mahmoud said that the Israeli forces arrested 7 civilians, including 2 girls, after severely beating them up and wounding them. The arrested persons were identified as Rayhana ‘Odah, Rifqa al-Qawasmi, Adam al-Qawasmi, Isma’il Hussain, Ahmed Hussain, Mohanad Mahmoud, and Ibrahim Hussain. All of them were taken to Salah al-Deen Police Station. On Friday, 15 December 2017, dozens of areas in Jerusalem witnessed sit-ins, protests, and clashes between angry Palestinian young men and Israeli forces, who used excessive force to suppress the protestors. As a result, a Palestinian civilian, from ‘Anata village, east of the city, was killed and ten other civilians sustained various wounds. Following the Friday prayer, the Israeli forces used force to disperse a demonstration started from al-Aqsa Mosque towards the Old City and Bab al-‘Amoud (Damascus Gate) area. When protestors arrived at al-Wad Street, the Israeli forces attacked them, pushed them, and beat them up. The Israeli forces also pepper-sprayed the protesters and forced them to move backwards to Bab al-‘Asbat (Lions Gate) and the Old City area. Meanwhile, dozens of protestors managed to challenge the iron barriers and made their way to Bab al-‘Amoud, where the Israeli forces established the barriers at its entrance. The Israeli forces also heavily deployed in the vicinity of Bab al-‘Amoud to prevent the Palestinian civilians from gathering or siting-in in the area, but the participants could pass the barriers and head to Bab al-‘Amoud (Damascus Gate) yard. The eyewitnesses said that the Israeli forces forced the civilians to leave the yard, beat them, and used sniffer dogs. The eyewitnesses also said that many civilians, including women and young men, sustained bruises and wounds, suffered tear gas inhalation, and fainted due to severe beating and tear gas canisters fired at them. The Israeli forces also pushed and beat a blind young woman, forcing her to leave Bab al-‘Amoud (Damascus Gate) yard. Moreover, the Israeli forces attacked Palestinian civilians on Sultan Suliman, Nablus, and al-Mosrarah Streets. On Friday clashes, the Israeli forces arrested 10 civilians, including a young man with a fractured foot and walking crutches. PCHR’s fieldworker could not identify the names of the arrested persons because they are from different areas. Following the Friday prayers, dozens of Palestinian young men gathered in the vicinity of Qalandia military checkpoint at the northern entrance to occupied Jerusalem. Israeli forces used live bullets, rubber-coated metal bullets, tear gas canisters, and sound bombs to disperse the young men. As a result, 10 civilians were wounded. Three of them were hit with live bullets while 7 others were hit with rubber-coated metal bullets. The health condition of one of the wounded persons was classified as serious. Following afternoon prayer on Friday, residents of ‘Atana village, east of occupied Jerusalem, organized a demonstration at the village intersection. The protestors threw stones at Israeli settlers’ vehicles passing via the intersection between north and south of the West Bank. As a result, one of the vehicles windows sustained damage. A force of Israeli soldiers immediately arrived and then heavily opened fire at them. As a result, Basil Mohamed Ibrahim (29), was hit with a live bullet to his chest and then taken to al-Eman Medical Center in the village. He was then transferred to Palestine Medical Complex in Ramallah because his health condition was serious. At approximately 18:30, medical sources at the hospital declared that Basil succumbed to his wounds. At approximately 14:00 on Saturday, 16 December 2017, Israeli forces used force to break up a sit-in organized by dozens of Palestinian young men on Salah al-Deen Street in the center of occupied Jerusalem. The Israeli forces heavily fired tear gas canisters and sound bombs at them, causing fear among the school students while returning to their houses. The Israeli forces also targeted a press crew, who was in the area. As a result, 3 journalists identified as Maisa Abu Ghazallah, Najeeb al-Razem, and Mohamed al-Sayyad, sustained shrapnel scattered from sound bombs while covering the sit-in. Additionally, the Israeli forces detained photojournalist Ameen Siyam for few hours. It should be noted that the Israeli forces arrested 4 Palestinian young men; 2 of them were identified as activist ‘Awad al-Salimah and Mohamed Bilal Hamada (24). On Wednesday, 20 December 2017, a demonstration started from the center of Ramallah and al-Bireh towards Qalandia military checkpoint, north of occupied Jerusalem. When protestors approached the checkpoint, Israeli forces stationed at the checkpoint fired live bullets, rubber-coated metal bullets, and tear gas canisters at them. The Israeli forces also sprayed waste water at them. As a result, 6 protestors were wounded; one of them sustained a live bullet wound; 4 others sustained rubber-coated metal bullet wounds; and the last one was directly hit with a tear gas canister. In afternoon, Israeli forces used force to break up a sit-in organized by dozens of Palestinian young men on Salah al-Deen Street in the center of occupied Jerusalem. The Israeli forces heavily fired tear gas canisters and sound bombs at them, causing fear among the school students while returning to their houses. The Israeli forces also targeted a press crew, who was in the area. An Israeli officer pepper-sprayed the young men, elderly men, and journalists and forced them to leave the area. Another officer chased a group of elderly men, who fell on the ground, and then directly pepper sprayed them. The Israeli forces also chased a Palestinian civilian, confiscated his flag, and then beat him up. As a result, he sustained various wounds and bruises. Meanwhile, a special force of Israeli soldiers indiscriminately fired sound bombs at civilians and deliberately fired the sound bombs at the area, where ambulance staff were treating the wounded persons. In the meantime, Israeli Mounted Police officers moved into the area and dispersed the protestors. When the officers suppressed the protest, the Israeli soldiers deliberately attacked press and medical staffs. They targeted journalist Diyala Jowihan and 2 other medical members and directly pepper-sprayed their farces. As a result, Diyala along with the medical members were taken to al-Maqased Hospital to receive medical treatment. Moreover, the Israeli forces arrested Ahmed al-Safadi, Director of Elia Media Institution, while he was on Salah al-Deen Street. In Bab al-‘Amoud area, the Israeli forces arrested a Palestinian civilian after attacking him with a Taser. At approximately 19:00 on Wednesday, dozens of Palestinian young men organized a protest in Abu Dis village, east of occupied Jerusalem in the vicinity of the annexation wall. When the protestors approached the annexation wall, Israeli forces fired live bullets, rubber-coated metal bullets, and tear gas canisters at them. As a result, a Palestinian civilian was hit with a live bullet to the foot. On Tuesday, 19 December 2017, The Israeli Municipality forced Hitham Abu Rumuz to self-demolish his house in Ras al-‘Amoud neighborhood in Silwan village, under the pretext of non-licensing. Hitham said that he self-demolished his house to implement the Israeli Municipality decision and to avoid demolition costs and paying a fine. Hitham added that his 150-square-meter house was built of tin plates and bricks-roofed. He also said that his 2-storey house was built 10 years ago. For Four years, the Israeli Municipality staff prosecuted Hitham under the pretext that his house was not licensed. Thus, he attempted to license his house and delay the demolition decision until the final decision to demolish the house was issued. Hitham clarified that his son was supposed to live in the house next April, but the Israeli Municipality forced them to demolish the house, pointing out that his floor was built above his family house. On Saturday, 16 December 2017, Israeli forces raided and searched Abu Jihad Museum for Prisoner Movement Affairs in Abu Dis village, east of occupied Jerusalem. They searched documents and photographic materials which document the Israeli forces’ practices. Fahd Abu El-Haj, the Museum’s Director, said that a large force of Israeli soldiers raided and searched the museum in al-Quds Abu Dis University. He added that they have not yet identified the damage and he is sure the Israeli forces confiscated some documents. The Museum contains 130,000 documents in the archives department, which was destroyed by the Israeli forces. He also confirmed that the museum displays humanitarian stories of the Palestinian prisoners and documents the history of prisoner movement established in 1997, to maintain the cultural and literary heritage of the prisoner movement. It also exhibits the prisoners’ handicrafts, their messages and news, and their literary and cultural productions. The museum was opened as part of the Abu Dis University in 2007 and funded by the Arab Fund for Economic and Social Development in Kuwait.